Police K390...yea it's freaking awesome. Re: Police K390...yea it's freaking awesome. It seems to me that pork yields better patina on K390 where beef was more effective on Superblue. I waited a long time to get the Police 4 and I have been totally enjoying it for the last month or so. I really like the new blade shape, it makes a big difference when cutting to have that extra belly, much more of the blade edge is usable for each cut. My initial impression when I removed it from the box was that the new version somehow had a bigger appearance about it, and despite having the same blade and overall length somehow seemed to have different proportions than what I was accustomed to with the Police 3 that I have carried for many years. I think it is an illusion caused by the lack of blade swedge and larger opening hole on the P4. The new blade shape is definitely more Military'ish, which I really like. The handle shape is very similar to the Police 3, but with a slightly faded or washed-out outline in the grip area. At first I did not like the newish handle shape of the P4, but as much as I visually still prefer the appearance of the P3 handle, I do consider the P4 to be more comfortable in use. 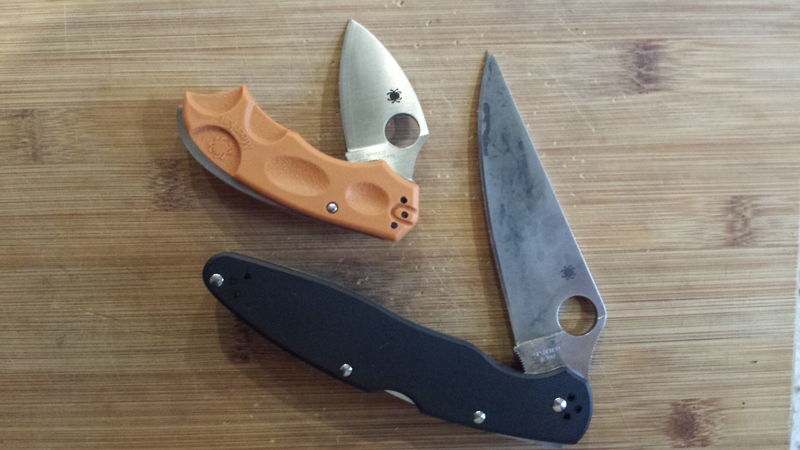 Like other impression I have read about, I did find the edge sharpened with a much steeper angle than I am accustomed to getting on a Spyderco. It was still sharp, so no complaint but I always re-profile my pocket knives with my preferred edge anyway. Usually I wait to dull the original factory edge before re-profiling it but I went and did this one right away. I re-profiled it (at ~15 degrees per side) so that I can touch up my edge with a micro-bevel on the Sharpmaker with literally a couple light passes when necessary. I haven't had to touch it up yet, I would have had to touch up my VG-10 P3 once by now for my type of use - light daily tasks and food prep. I do find myself thinking about care and maintenance of the blade much more due to the steel type, so as much as I am really happy with K390 performance, I am looking forward to trying other versions with stainless steel. I do find the steel much less prone to rolling than VG-10 in use and the edge requires much less touch up. The K390 is a noticeably harder steel compared to VG-10. I haven't experience any chipped edge yet. I am really happy to have what I consider to be a back lock version of the Military. I only like back lock pocket knives, but have had the Miltary for many years because it is such a nice design, despite its locking system. For the first time since I got it, I feel that my Military (CF BG-42) is redundant to me now. I found that the fit and finish on the knife is very high, the action is very smooth even without break-in and I think that I prefer the lack of the Boyde detent (for cosmetic reasons). Overall, I am really happy with this knife plan on keeping it permanently. Just like all previous version of the Police, for a large knife, it pockets very easily due to its slimness. The K390 steel has been a very interesting experiment for me, I never usually consider non-stainless steel and I am enjoying the properties of this steel so far. Had a Police on loan for a backpacking trip in mid 90's. First Spyderco I ever used. Didn't think twice about it. The whole time I had it, I would open it like a traditional knife, holding it by the spine lol. I do like this new one a lot. Can't get over the size for the weight and slimness. Very much enjoying the K390 as it keeps an edge. My dedicated camping folder, always in rear pocket. Military got dethroned. I make the mrs carry Military (all she knows is Delica) when camping. Last edited by abbazaba on Wed Oct 18, 2017 8:46 pm, edited 1 time in total. The store I bought mine from is sold-out of them, that is a pretty good indicator of the new knife's reception. It makes me happy seeing the Police get so much love. Makes me hopeful we'll see more variations of the P4 compared to the 3. Patina is getting there. I've had the Police on the road and it has served me very well so far. Vivi wrote: It makes me happy seeing the Police get so much love. Makes me hopeful we'll see more variations of the P4 compared to the 3. Me too, its so nice to finally have a folder larger than the Endura that still has a thin blade, and it seems that others (myself included) are enjoying it for this same reason. I really hope the P4 will get the Sprint Run treatment. I’ve been very happy with my Police 4. Haven’t been able to kick it out of my pocket since I got it, but that will change soon because I’ll be carrying the 52100 Para 2 soon. I was very pleasantly surprised by how well the steel sharpened up to a crisp, burr free edge at 9 degrees per side. It was able to split some hairs at 500 grit followed by a few passes per side with a 16000 grit stone. After about 200’ of cardboard it slices phonebook paper cleanly with ease, though that isn’t necessarily a huge feat for a properly sharpened knife unless you hit some really dirty cardboard. It did hold on to its ability to pushcut phonebook paper for around 100’ of cardboard in many spots on the edge. 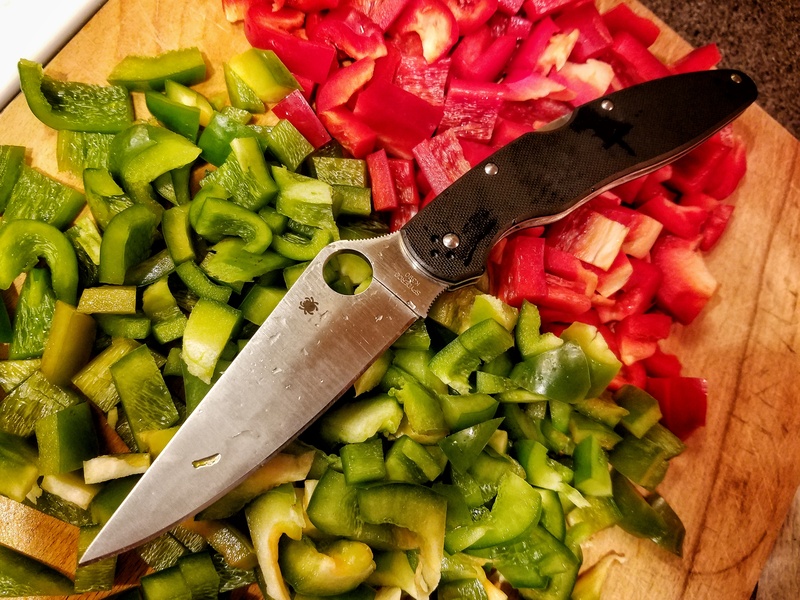 The knife is a good slicer for a factory blade, and aside from some needing to break the edges on the inside of the scales the ergonomics are very good. It carries in the pocket very nicely for such a huge blade. I look forward to seeing what the FRn version of this will bring, assuming the sales justify it. I wonder if the FRN version will also be K390. After briefly owning the Police4 I think I might prefer the FRN version. There's a lot I liked about the P4 but the drawback to its ease of carry is the thin handle bit into my hand when cutting forcefully. I would expect the FRN version to be slightly thicker. ABX2011 wrote: I wonder if the FRN version will also be K390. I am contemplating a set of custom scales for mine. But, with thick, contoured custom scales, the P4 would be pretty awesome, I'll admit. It sounds weird, but I've found the same with respect to K390 & M4. 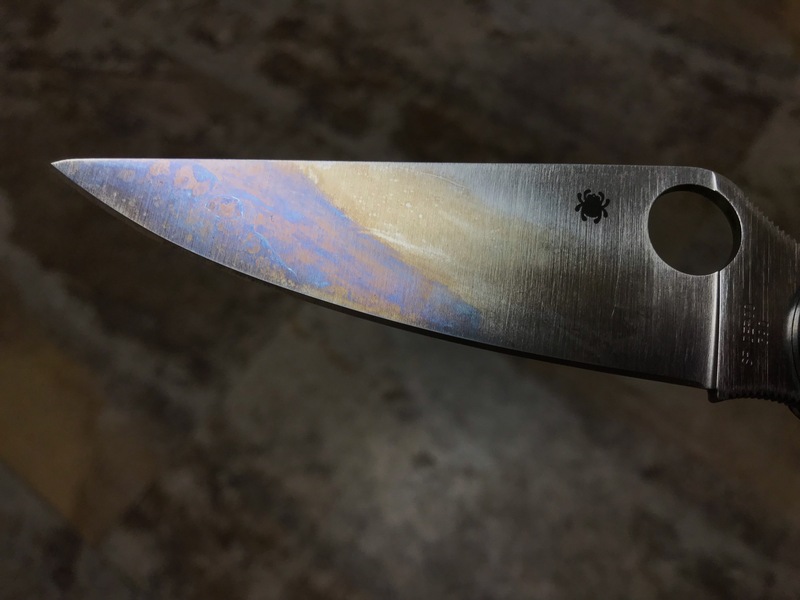 For that indigo patina, M4 likes beef, K390 pork. ....So after you guys are done using your knives in the kitchen, how do you clean the knife and handles? Just a wipe off? soap and water on the blade? Soap and water on the handle? Any rust issues with the blade or liner? I try to really avoid submerging the knife when cleaning and always rinse from the pivot to the tip. Mostly I use mild detergent and warm water for cleanup. My K390 has little to no signs of rust or spots. As for that beautiful patina forming in the above picture it makes me want to clean mine with BKF and start over. I have found the P4 to be right handy as an improvised kitchen blade when camping or tailgating but I would (and am considering) want the blade reground to a much thinner geometry. Thanks! I've been toying with the idea of getting one of these (it's either this or the Ikuchi). He's super busy making his own knives these days, but deadboxhero (tripleBhandmade) does really nice regrinds, and keeps it thin. I just saw him do a Native Salt and an endura on his Instagram. If I wanted something ground thin, he'd be the first person I'd go to. Listening to him talk about the Police 4 and K390 is what got me interested in this knife, even though it would be nearly twice the size of my usual choices. I will keep that in mind. Several of my trusty favorites need a diet if you get my drift. To add to the other replies, I always have a can of compressed air handy to blow any water out of the pivot and scales/liners after washing a blade. Initially I did this with my kitchen mule since the scales aren't glued down and I'd found some rust underneath after months of use and frequent washings (B70P,) but quickly adopted it as a best practice with my folders as well.